Don't Let Your Equipment Waste Money Due to Inefficiency--Get a Tune-up! Don't you wish you could keep your utility bills downs and decrease the number of costly repairs? Now you can with money-saving preventative maintenance. To get your equipment serviced for maintenance, Contact us online or call 1-800-888-1045. Heating, cooling, and water heating systems combined take up the majority of your annual utility bills (60%, according to Energystar.gov), so it's important to maintain them to keep them running efficiently and safely. Why Should I Get Preventative Maintenance For My Heating and Cooling System? Keeps your utility bills from skyrocketing- Just as getting a tune-up for your car can improve its gas mileage, a yearly tune-up for your heating and cooling system can improve its efficiency and therefore keep your electric bills down. Prevents number of costly breakdowns- Your heating and cooling equipment is expensive-- and it's expensive when it breaks, too. Preventative maintenance catches minor problems before they become a hefty repair bill. Prevents you from voiding your warranty- Any heating and cooling equipment you have is covered under a warranty...unless you fail to get it professionally maintained annually. How Often and When Should I Get My Heating and Cooling Equipment Tuned Up? How Often: Your cooling and heating systems each need a professional tune-up once a year. 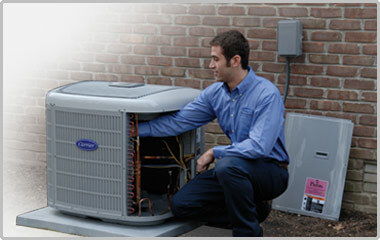 To get your heating and cooling systems serviced for maintenance, Contact us online or call 1-800-888-1045. Why Should I Get Preventative Maintenance For My Water Heater? Increases your water heating bill- The average household spends $400-$600 per year on water heating-- sediment can increase that cost even further. Sediment sinks to the bottom of your tank and covers the heating element, forcing your water heater to run longer to properly heat the water. Grows bacteria in your water-A layer of sediment becomes a breeding ground for bacteria that cause various illnesses--including Legionnaire’s disease. Deteriorates the tank--Sediment causes your water heater to run longer than normal, causing the the glass lining and steel tank to overheat. This leads to your water heater deteriorating and failing prematurely. How Often Should I Get My Water Heater Maintained? Your water heater needs to be flushed of sediment once a year. To get your water heater professionally flushed, Contact us online or call 1-800-888-1045.